Plus there's no way you can slather greasepaint on your cheeks day by day and not start to think about it as war paint. And when war paint goes on the face, things can get violent real fast. I received this book from netgalley in exchange for an honest review. I didn't know what to expect going in, figuring it was some sort of humor book - which it is. I never thought it would be so incredibly involved - every piece of costume is disected on a clown's evil meaning, every type of face paint, every form of clown, different locations you can find clowns, a list of famous clowns (Krusty from the Simpsons, Pennywise, Ronald McDonald, Joker, John Wayne Gacy). It's amusing and hyper paranoid. 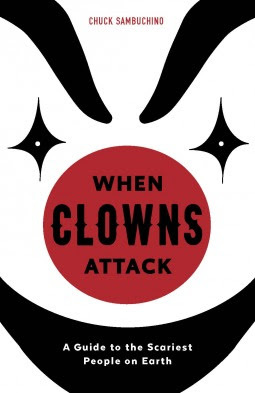 The book ends with chapters on weapons against clowns, weapons THEY have, and goes on for awhile. While cute, it's hard to hold interest for a full book. This is more of a gag gift for those who are afraid of clowns and want to laugh at themselves. It's not a serious book that actually examines true fear of clowns, although some of that is in there too. Kudos to the author for being so indepth with all angles of clown disaster, even if some of the jokes are carried too far. This seemed to be a good review to slap up considering Halloween is around the corner - enjoy the holiday, clown costumes and all.